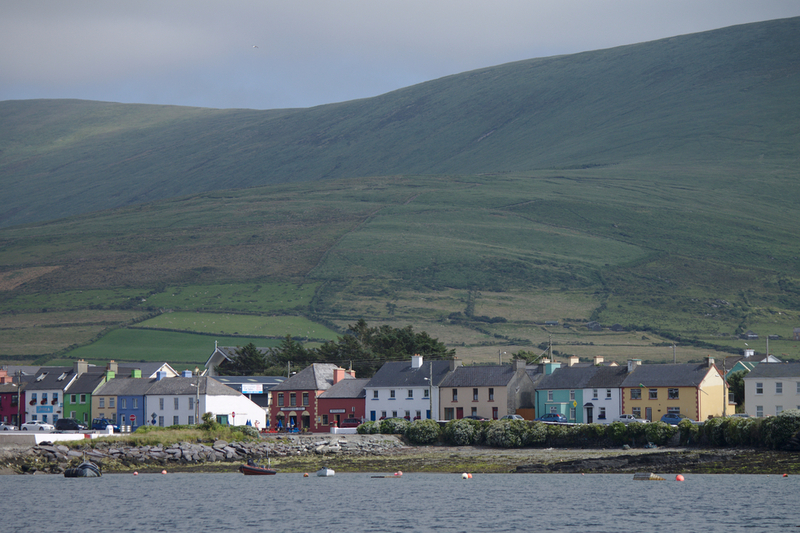 It was still cloudy at Portmagee, and a few swimmers and yakkers assembled on the pier to load the boats. We were outward bound on a small fishing boat with two support yakkers and skipper Gearóid’s family out for a day trip, and left the pier at 11.15am, heading out through the calm channel. 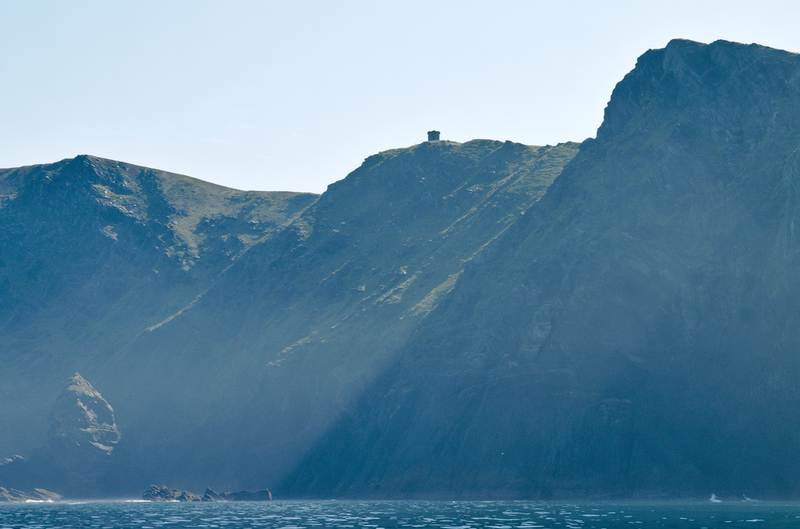 The first ever transatlantic cable came ashore at Valentia and for many years down at the extreme edge of Europe, Valentia Cable Station was centre of the communications world. We passed Bray Head, moving out into the open ocean. With the kayaks the small fishing boat was cramped, and I, the only swimmer on board, had nowhere to sit as the yakkers claimed the seats, but I’m happy on a boat and the swim was due to be short. The sky was still cloudy, with no sign yet of the Sun breaking through. 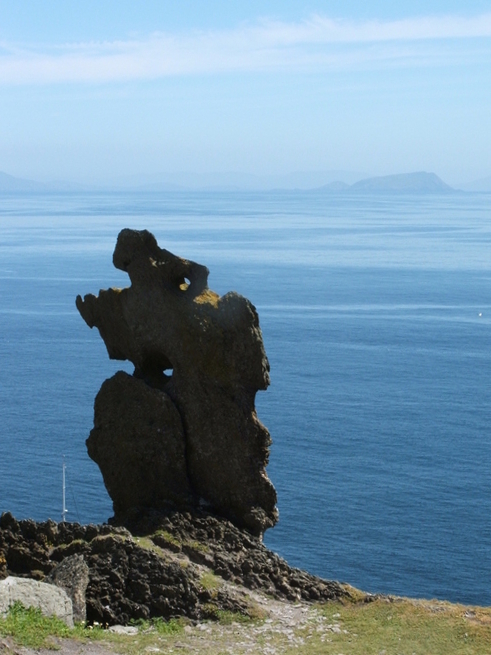 As we moved out west from the shelter of Puffin Island to the south, Bray Head to the north and away from the distant protective shelter of the Blaskett Islands, the swell increased. Along with the Force Two breeze, the water became choppy. Many a breakfast has been lost overboard on the way to the Skelligs to those lacking sea-legs. 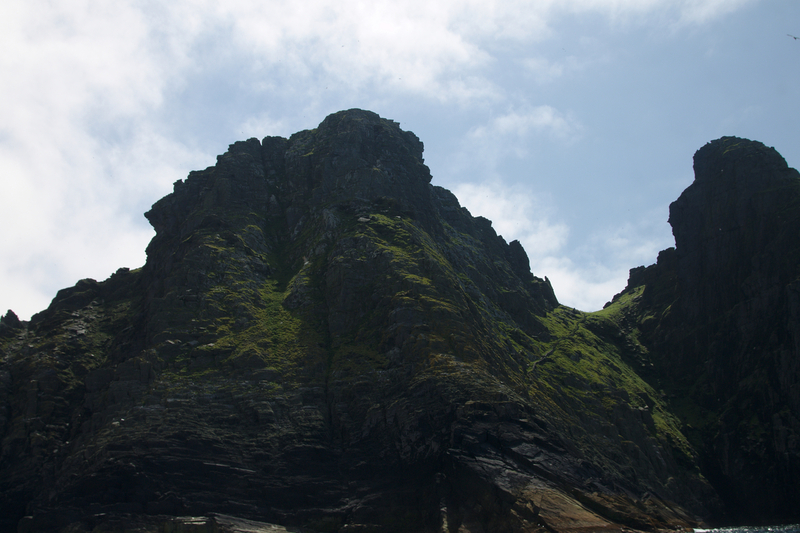 I can never steam out to the isolated crags of the Skelligs without thinking of those early monks. The Roman Empire had fallen, Europe had sunk into the Dark Ages, organised society and civilisation fragmented and hundreds of years of chaos lay ahead. Only on Ireland was the learning retained, the early Irish Christian church retaining the knowledge embedded in religion and the skills of writing, illustration and teaching. They founded the Irish monasteries, centres of learning, and then as their number grew they travelled to Scotland, down through Britain and on into Europe, carrying knowledge and artistry and the ideal of scholarship with them, many of their later European sites becoming the great European colleges. The author Thomas Cahill described this as the time when the Irish saved civilisation and it was a time of importance for the country, prior to being a nation, and the time that gave Ireland the appellation of Island of Saints and Scholars. Some of those men though, looked west, saw a lofty peak out where there was nothing and somehow decided it would be a good place to pursue the ultimate ascetic life, the thought that the peak was already partway to heaven surely in their minds. Regardless of belief, something about the insanity and heroism of that has always struck a chord. Woollen robes, simple tools and a willingness to face the Utter Sea. Surely this resonance must strike any open water swimmer? Steaming out to the island took about 90 minutes. 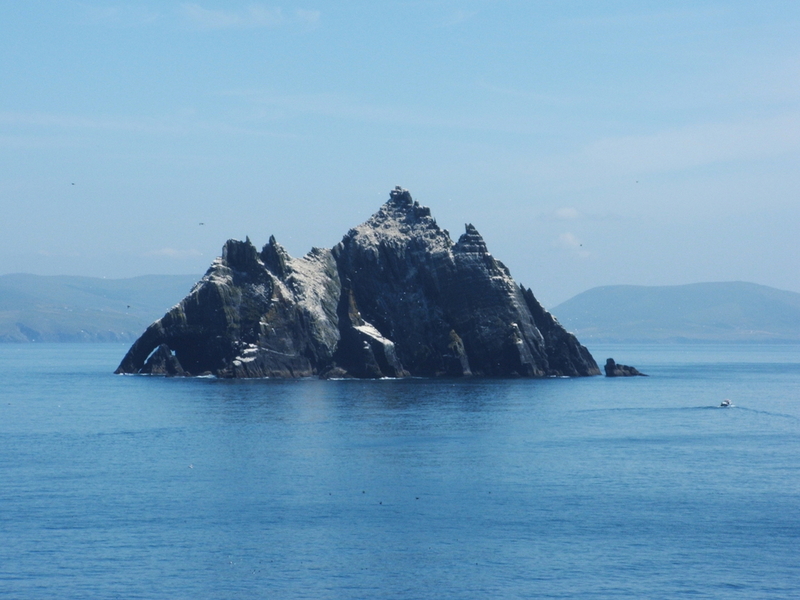 Heading for Skellig Mór, one passes the white guano-covered Skellig Beag, “small Skellig“. Skellig Beag is the second-largest gannet colony in the world after St. Kilda in Scotland, with about 30,000 breeding pairs, around 20% of the world population. Gannets, white with a yellow head and black wing-tips, are a large raucous seabird which feed by diving on fish from a height and can dive down to thirty metres. The repeated blows to the skull are the primary cause of their demise as they go eventually blind. They wheel and spin and cry in the air around the Skelligs and range far out over the sea in these very rich fishing waters. 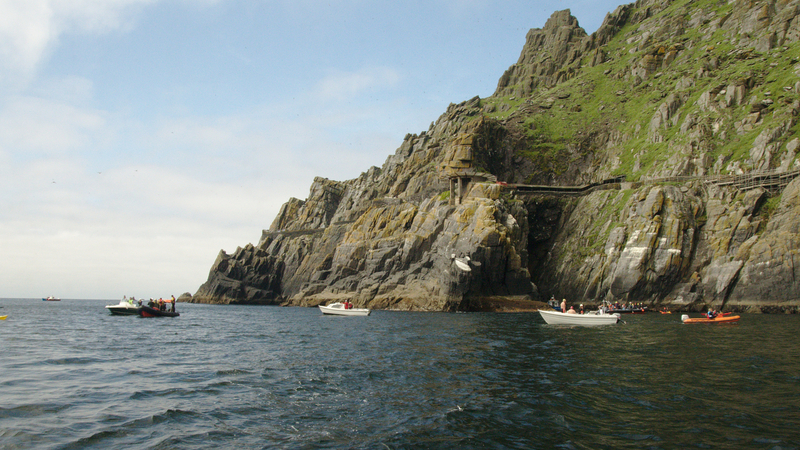 Skellig Michael – approaching the East Landing from the South east, the new road to the Lighthouse leading up left from the bottom of the picture. The huts are just below the right side peak. The rib carrying swimmers from Portmagee zipped past us before we reached the island on our slower boat, and the Ballinscelligs Inshore Rescue rib with the remaining swimmers, the charity for whom the swim was being carried out were seen arriving from Ballinscelligs Bay. Before the start at Cross Cove, the covered walkway over the cove is due to a continuous barrage of bird droppings. The steps to the top of the island run up the ridge . 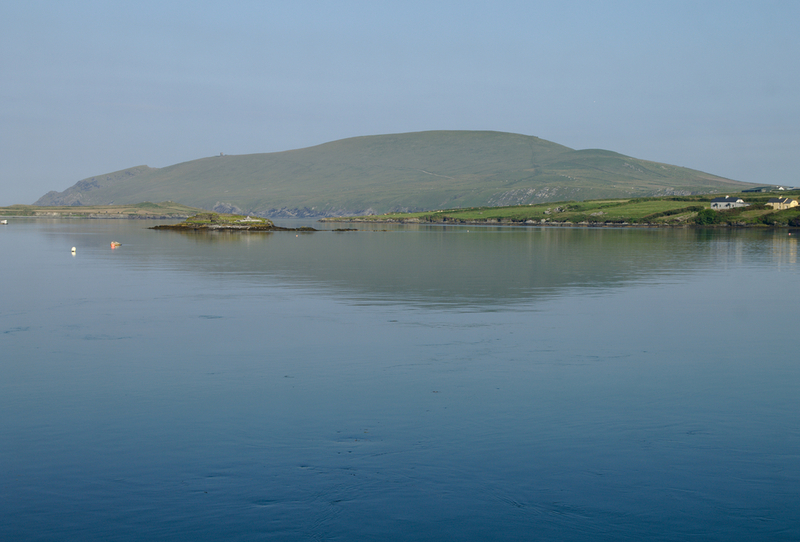 Kayaks were quickly put in the water near the East Landing at Blind Man’s Cove, boats milled around for fifteen minutes while skipper Gearóid indicated the starting point would be to the west underneath the helicopter pad and in front of the covered walkway leading around Cross Cove. The swimmers were split into two groups, a larger group of slower swimmers and few faster swimmers to start a couple of minutes later. Looking forward to getting in, I was first ready. As it turned out I was in togs for a good five minutes, but the slight breeze on this protected side of the island was warm and the Sun was finally breaking through as the clouds parted overhead so I wasn’t getting cold. As I waited I heard a call of my name, but assumed there was another Donal out there, it being a name rarely heard outside Ireland but quite normal here, (by the way Donal is NOT Donald, as a name Donal goes back at least 2,000 years). 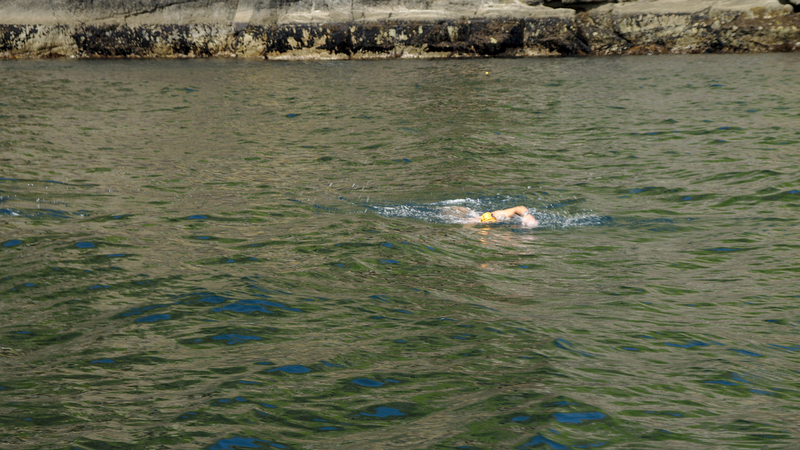 But we soon noticed that a small inshore boat carried my friends Liz Buckley (no relation but we call her my fake half-sister) Chairwoman of the Sandycove Island Swim Club and her boyfriend Padraig Leahy, both strong and experienced open water swimmers. The first wave in the distance being chased by Liz, Padraig, myself and a couple of others. 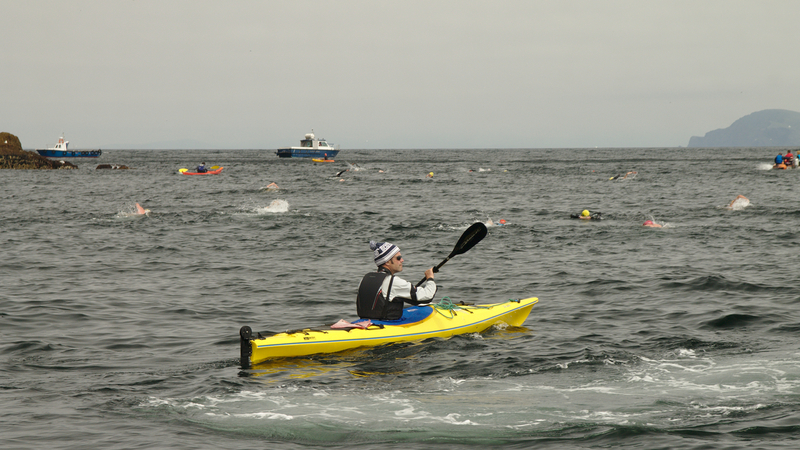 Swim Organiser Tim Poulain-Patterson in the yellow kayak. The first group was soon off, heading north-east to swim anti-clockwise around the island. And shortly thereafter I was off the boat into the water, turning to wave at Dee and then off. The calm protected water of the south-east of the island slipped past. Tim was nearby in his kayak, the other boats moving to the outside. Underneath the water was deepening shades of grey-green. As we approached the northern-most point of the island, the waves of the open ocean swell were readily apparent even to a cursory sighting, crashing onto the reef. I’d already caught a few of the slow group, and continuing my long tendency to skirt rocks closely, I moved in closer while the others moved out. Under the water as I approached the was filled with white foam. I don’t really understand why I like swimming near rocks, something subconscious from my surfing, something which I also rely on to tell me when it’s safe and when it’s not. I avoid the rocks on Sandycove first corner in a big a swell because there’s no safe close approach whereas I can skirt the second corner closely. The north-east corner of the island, calm to rough water in a few metres. I passed through the foam, an arm length from the reef, the water rising ahead of me as I swam up the hill of the swell. Then a left turn and along the north side. The boats moved a long way out, as did the large majority of the pack. Dee later told me it became very uncomfortable on the boat at that point as they were only bobbing along at swimming speed, the swell and chop buffeting the boat. Just past the reef of the North east corner where the water became much rougher. Along with the Sun directly south, and the distance out from me as I continued on ahead,any photography became very difficult. 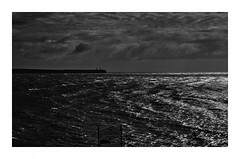 I sought a line along the north shore, against the tide also, where I would be in closer but not so close that I was caught in every wave reflected of the island, trying to find a balance that would mean I was in rough water that was combined from both sides, but not swimming too wide or close. I like rough water, as many experienced open water swimmers do, for a short swim like this. It adds a certain frisson and liveliness to a swim. This water was rough, certainly not for inexperienced swimmers. I stopped to take a few photos from a borrowed waterproof camera. (Did I tell you I lost another camera to the Sea only a week ago, thanks to bloody shore anglers fishing into the swimming zone at the Guillamenes?). The water on the north side was also colder, my internal thermometer again telling me that it was about twelve to twelve and half degrees. But the Sun was directly overhead in front of me and the shots were poor. I swam on, gradually south-west, passing the deep cut of North Cove, the older steps that were the original peak access line, visible far above in glimpses, now no-longer used. Occasional jellyfish of different types passed underneath. The colour of the water was… rich. To just describe it as sea-green or grey-green is insufficient. In coastal waters, our water is mostly sea-green, dropping away to black from the ocean floor, which even when it’s not visible stop light. Out at the Skelligs the bottom is far below, the water dropped through shades of a grey-green. Artichoke, aquamarine and zomp, skobeloff, feldgrau and jade, malachite and viridian and midnight-green all blending and fading into each other, that conveyed the depth below us. 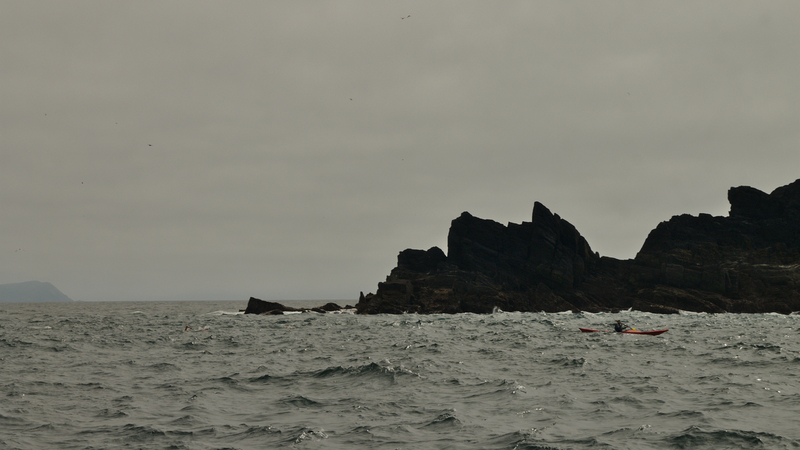 I remembered my first Skellig swim years ago, when the depth made me take a minute to pause and readjust mentally. That adjustment was no longer necessary, though I don’t often get to swim in very deep water, like many other things of the Sea that people dislike, I find myself entranced by the idea of the abysm beneath, dragging myself over the watery surface by the power of my arms, the idea of the void sucking deep in my gut. Deep and rough water, what a joy. I reached the north-west corner and along west side of the island, Washerwoman Rocks on the west outside, the cliffs here rising sheer from the water. I know the geography of the island and stopped, because far above was a glimpse of the old disused Lighthouse. Two swimmers approached and stopped and I pointed out the Light and told them how back the 1950’s the windows had been broken out by a wave. The old Lighthouse is over 110 metres high. Three hundred and sixty feet up. That was some wave, surely one of those rogues that we now know exist in deep water. As I crossed Seal Cove, beneath the new Lighthouse, the water calmed and as I rounded the south-west corner, it flattened out and ahead was Cross Cove. I swung under the helipad and walkway for another picture and passed over a huge Compass jellyfish, less than a body length down. Then back to the Inshore Rib to indicate I’d finished. With stops I’d still taken only about 50 minutes, an easy fun swim. At this point it became apparent that the boat with Dee, and my clothes was far back, so rather than float and get cool, I swam back toward them, and at that point they caught up quickly. It was a fun swim, a chance to finally swim fully around the island that I’d long wanted to complete. With the last finisher coming in after almost one hour and forty minutes swimming, it was probable that the location and conditions may have been too much for a few of the group. I doubt such a large group, 20 swimmers, will do this swim again, given the rough conditions, it was difficult for all the boats to watch everyone. Any future swims will likely and should be much reduced in number given the complexity and safety cover needed but this one had went well and probably is a relief for Tim to have out of the way, as some swimmer’s unaware of the difficulty of running a swim in a location like this, were somewhat unreasonable in their expectations, and credit goes to him for finally getting it finished. And I’d like to thank Tim myself for allowing me to get this swim off my list. 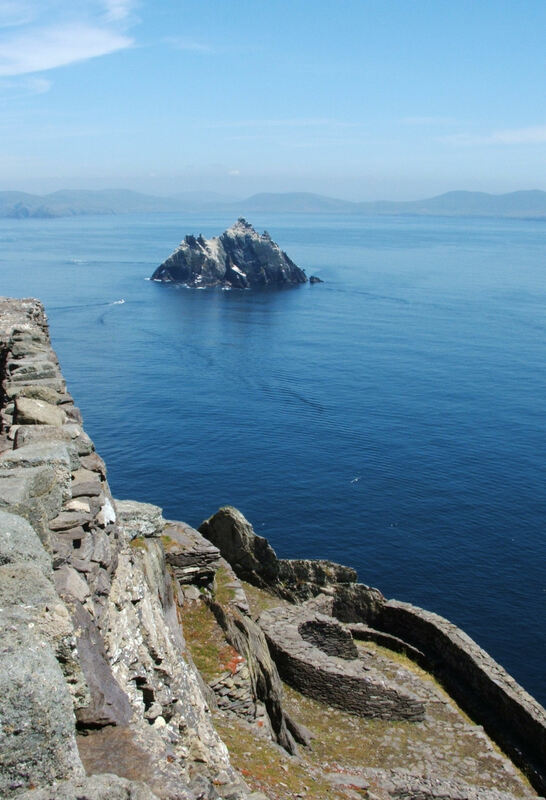 Brilliant writing about the Skelligs ~ you had me with you every stroke of the way! Thanks again Jean. 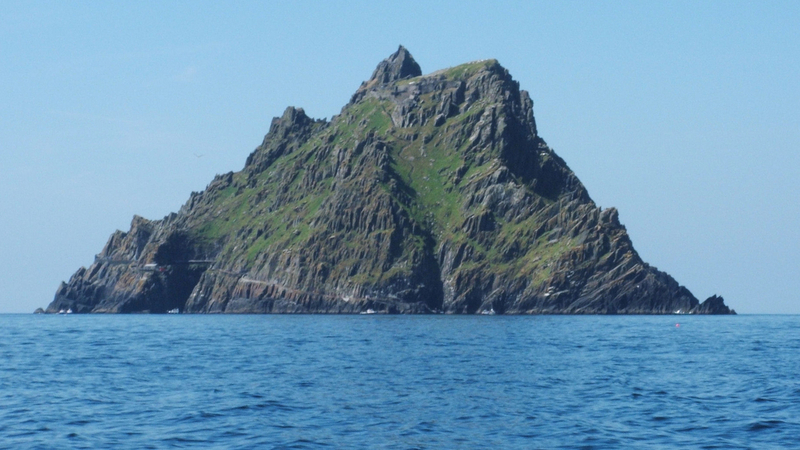 If only the Skelligs were on the Copper Coast! Ah now, let’s be very grateful for what we have in Co. Waterford! 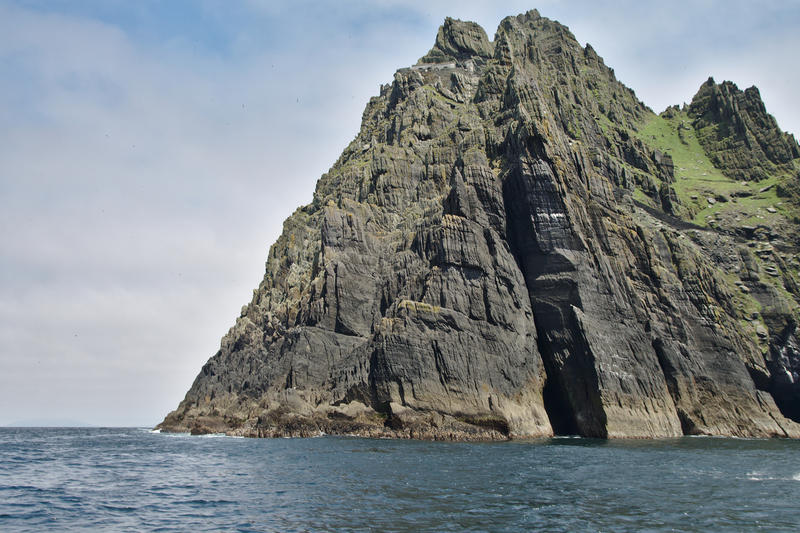 ‘Canst thou draw out leviathan with an hook?’ Skelligs Ahoy!!! 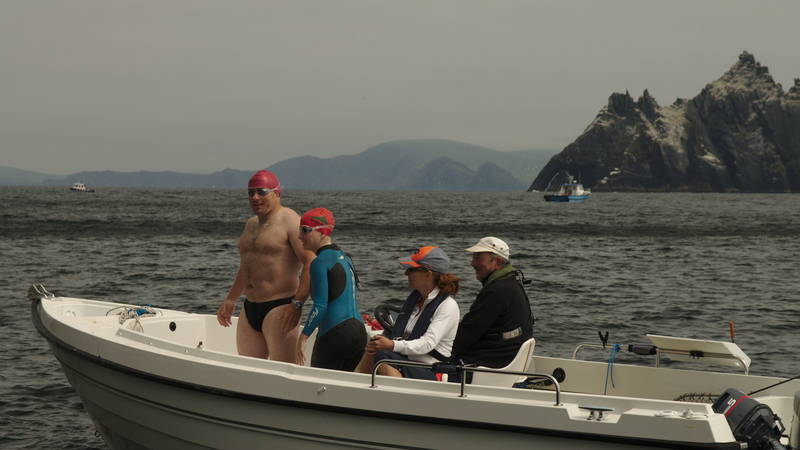 Great stuff Donal, I really enjoyed your pieces on the Skellig swim, very evocative. Thanks. Gorgeous! 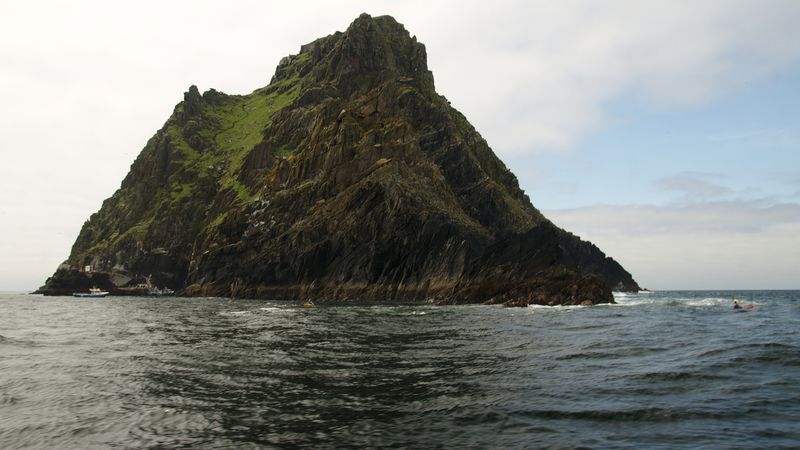 Such haunting features, those Skelligs. Also, nice new header image! They really are. Something I’ve noticed over the years is the relatively small number of Irish people who visit compared to Germans and Dutch especially. And there was an unfortunate case a couple of years of an American tourist who fell from Christ’s Saddle (and obviously died) and the family took a case against the OPW (Office of Public Works) that guard rails be put on both sides. Here’s a pic of the top path, with a sheer drop on either side. But to do so would be like put a guardrail around the Grand Canyon. The headers are now on random rotation, just for a change so I’ve no idea which one you saw. Hey there. I managed the ring of kerry today on my bike. If you are heading out for a casual swim tomorrow let me know as I am staying in Derrynane. I’m back home Lar, cheers anyway.